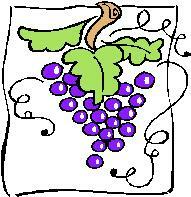 Grapes facts, an information sheet for kids cooking activities. 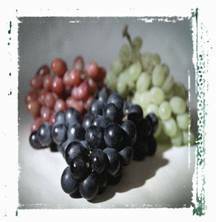 Grapes facts and general information about grapes. Grapes grow on vines in a cluster. Buy grapes that are firm and good color for their variety. Avoid soft or browned grapes. Store unwashed in the fridge. Wash when ready to use or eat. Grapes are a great snack. They can be used in salads, made into juice, dried. Try grape fruit leather for a healthy snack. Grapes are full of Vitamin K and Vitamin C. They also have fiber, iron and calcium. Combine ingredients together and serve in croissants. In mixing bowl, blend cream cheese, sour cream, vinegar, vanilla and brown sugar together. Toss in grapes and nuts and stir gently to coat. Add a small container of this to your kids lunch boxes! THEN SIT BACK AND ENJOY!! Back to Food Facts page from Grapes Facts.